It's no secret that, alongside cycling's major personal health benefits, riding is also a great way to help reduce pollution. Axiom further aids the cause with their Seymour Oceanweave Pannier Set, made from 600D polyester that's sourced from recycled fishnets that would otherwise be discarded in our oceans. The resulting fabric is just as resilient as standard polyester fabrics, and a waterproof polyurethane coating is added to keep water from getting to your gear. Inside you'll find 22 L of storage with a drawstring closure in case of oversize items or just trying to fill every last cubic inch. The Seymour panniers have organization aplenty with mesh pockets and a zippered rear pocket, plus daisy chain webbing for lashing accessories or additional items. 22 L capacity. Claimed weight is 992 g / pair. 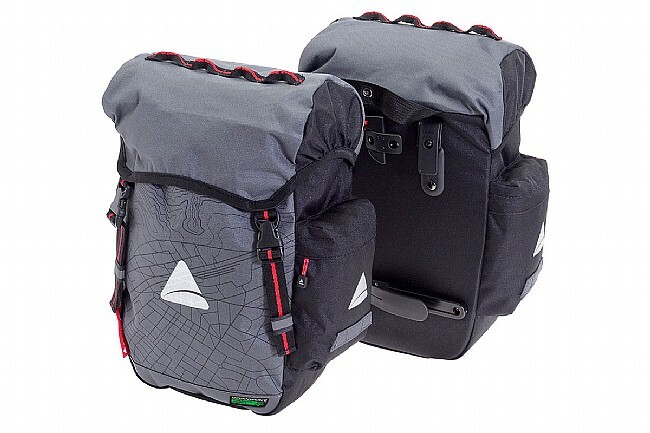 Tough panniers for commuting or travel. I love these bags. Just to give you an example of size I recently did a wine tour and fit 3 bottles of wine in each and had more room to spare. They hold weight great and do not sag or move once the attachment points are set. Would be great on a front rack. I commute to work six days a week 14 miles a day. Keep my rain gear in them. Have several bikes can switch from bike to bike easily. I can stop at store and pickup stuff. Still have enough room. I commute to work 6 days a week. Use them to carry my rain gear and extra tube,pump,tools. I bought this set a year ago. They have decent use and have held up very well. I have found them to be the perfect bag set for my new Gaezelle tour popular. I use these mostly for grocery shopping and doing errands. They attach easily to my bike rack and hold more than I anticipated they would. I've ridden in light rain and the inside stayed dry. Not sure about a downpour, but the bags can be cinched closed so well I'm sure the water would stay out? I'm going to send a pair to my daughter in Denver. They will be perfect for that climate, too.